67/190 Max Braden Braveheart played with history and it paid off. This messed with history and fell short. Rent Costner's version instead. 70/123 David Mumpower It's no Robin Hood: Men in Tights. PS: Hey, Russell Crowe! Lighten up, dude. Nobody likes a mean drunk. Then I found out that Ridley Scott had also executive produced Tristan and Isolde and it all made sense. This eagerly anticipated new film from Mr. Scott (can’t you just hear the sarcasm in my voice?) will re-envision the classic Robin Hood tale by framing the normally villainous Sherriff of Nottingham character as a sympathetic and noble lawman under the thumb of an evil king. He soon finds himself caught in a love triangle with the sumptuous Maid Marion and ruthless outlaw, Robin Hood. One imagines that the newly honorable Sherriff of Nottingham gets his tights in a tizzy when he finds out that his towering nobility is no match for the rugged, dangerous charm of Robin Hood. Nice guys finish last, don’t they Notty? This whole film premise sounds like a bad combination of two literary source materials: on one hand, you have the glorious novel, Wicked, by Gregory Maguire, who retold the Wizard of Oz story from the point of view of the Wicked Witch of the West. On the other hand, you have The True Story of the Three Little Pigs by Jon Scieszka who hilariously retold the story of those dastardly pigs and their structurally-incompetent houses from the point of view of the wolf. Now if Ridley Scott were a grandfather, you could imagine good ole Ridley reading these two books to his grandchildren as they drift off into dreamland. You could see the gears in his brain turning and turning, wondering what other classic tales would benefit from a complete behavioral re-programming of its villan. But Ridley is not a grandfather. He’s not even a father. He’s not even married. So unless he got cozy with some niece or nephew, I’m betting that Ridley rented 1991’s Robin Hood: Prince of Thieves and decided that there was too much tooth-gnashing by Alan Rickman. Whatever the case, Scott managed to get two fantastic, A-list stars to help him put together this “Steal from the rich, give to the poor . . . then steal the girl from the noble Sherriff” opus: Russell Crowe (with whom he worked on American Gangster) and Sienna Miller (hottie du jour). As uncomfortable as I am with this movie premise, if Scott was looking for someone who could combine nobility, menace, intelligence and irrational rage, he could do no better than Crowe. And as for Miller, her milky white skin and “come hither” eyes would set any two men to quarreling. 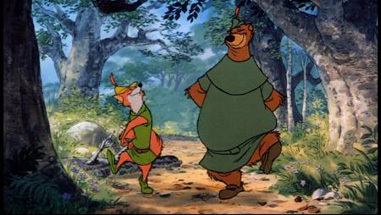 See the latest developments for this project on the Robin Hood Movie News page.